It wasn't just the sound of wedding bells at the marriage of Prince Harry and Meghan Markle - now the new Duke and Duchess of Sussex. The couple hand-selected the music to accompany the ceremony, which ranged from gospel to traditional hymns. Soul classic Stand By Me was among the music featured as was traditional hymn - and Welsh rugby anthem - Guide Me, O Thou Great Redeemer. The music reflected the personalities of the couple as individuals and celebrated a common theme: love. A statement from Kensington Palace said: "Both Prince Harry and Ms Markle have taken a great deal of interest and care in choosing the music for their service, which will include a number of well-known hymns and choral works." The music was overseen by James Vivian, the St George's Chapel's director of music and led by principal conductor, Christopher Warren-Green. The latter also conducted the music for the weddings of the Duke and Duchess of Cornwall and at 2011's wedding of the Duke and Duchess of Cambridge. Ms Markle walked down the aisle partly on her own. She was accompanied by Prince Charles for the final section of the journey, while Welsh soprano Elin Manahan-Thomas sang Eternal Source of Light Divine. During the service, the congregation sang hymns Lord of All Hopefulness with the choir singing E'en the Spirit of Truth and The Lord Bless You and Keep You. The congregation joined in for a hearty rendition of wedding favourite Guide Me, O Thou Great Redeemer. The hymn is also a nod to Prince Harry's links to Wales and his passion for sport. The hymn was first written in Welsh by Methodist preacher William Williams and is associated strongly with Welsh male voice choirs and for being sung at Welsh rugby matches. The Kingdom Choir, directed by its founder Karen Gibson, put on a moving performance of Stand By Me, made famous by singer Ben E King. Ms Gibson has since revealed that the uplifting gospel music had been the idea of the Prince of Wales. She said: "The couple didn't actually ring us at first, the call came from Clarence House. "I understand that Prince Charles really likes gospel music. "The couple were very intentional about what they wanted sung and how they wanted it sung, but the actual idea came from Prince Charles - although they were very happy to have gospel music." Stand By Me is a song picked by many couples on their wedding day for its message of enduring love. But for many, its lyrics also carry a deep political message. When the song first rose to popularity during the civil rights movement in the US, it was used as a rallying cry for solidarity among people of colour. Cellist and BBC Young Musician 2016 Sheku Kanneh-Mason performed three pieces of classical music for the couple, including Ave Maria. The 19-year old received a phone call from the Duchess of Sussex asking him to perform at the ceremony after Prince Harry had seen him play at a charity concert in London. The couple received a fanfare and the congregation sang a rousing version of the national anthem. 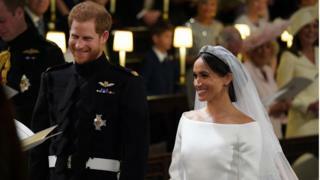 When the new duke and duchess finally walked down the aisle as a married couple, they were accompanied by the orchestra who played the processional music Symphony No 1 in B-flat major by William Boyce. As they left the nave of the chapel the choir burst into the gospel classic Amen/This Little Light of Mine. It is a favourite in African-American churches across the US and versions of the song have been sung by a string of soul artists from Otis Redding to Sam Cooke, but they performed the version by Etta James.